They rush into active shooter scenes and other unimaginably dangerous situations. What it's like to train and serve as a physician on a special operations team. On a quiet Saturday morning in October 2018, University of Pittsburgh emergency physician Keith Murray, MD, was helping his 3-year-old son get ready for a birthday party when the alert came on his phone. Active shooter. The Tree of Life synagogue. Within minutes, Murray was on his way to the scene. Donning body armor and helmet, he located other members of his SWAT team and approached the synagogue near downtown Pittsburgh. The 45-member unit divided into groups, entering the building at two separate locations. Inside: unspeakable carnage. Eleven dead. Many wounded. And the shooter was still somewhere in the building. When Murray’s contingent finally found him, automatic gunfire erupted. One officer was hit at least seven times. Although gravely wounded, the officer is alive today and recovering, says Murray, thanks in large part to the almost instantaneous response. Murray is one of a select but growing group of physicians around the country who serve as members of SWAT teams and other special operations units. 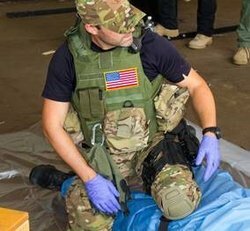 Experts in trauma medicine, triage, and mass casualty care, they’re also rigorously trained in the tactics of high-risk law enforcement operations — a hybrid practice so new there is as of yet no agreed-upon name for it. Law enforcement medicine — the term many experts prefer — has its roots in military medicine. “One of the invaluable lessons we’ve learned from the military over the past two decades is that the earlier we can render trauma care to critically injured people, the better their chances of survival,” says Matthew Levy, DO, associate professor of medicine and senior medical officer at Johns Hopkins Center for Law Enforcement Medicine. For example, one study of casualties in Iraq and Afghanistan found that immediate trauma care might have prevented almost one-quarter of the battlefield deaths. A physician trained in emergency medicine already has the basic medical knowledge needed for law enforcement medicine. Currently, no accredited law enforcement medicine subspecialty exists. But in recent years, a growing number of academic medicine institutions have begun offering tactical EMS components in emergency medicine programs, typically through affiliations with local law enforcement agencies. 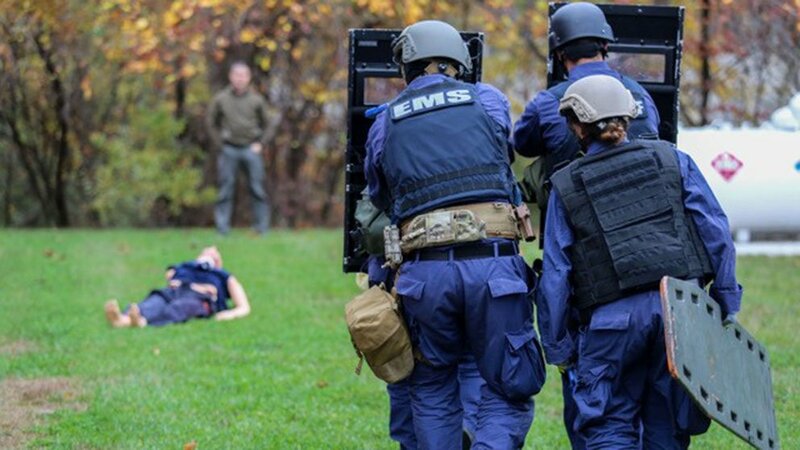 For over a decade, Johns Hopkins Medicine’s Center for Law Enforcement Medicine has offered a two-year fellowship in tactical medicine, which is open to physicians who have completed their emergency medicine residency. The program includes training in law enforcement principles and procedures, caring for the wounded during high-threat situations, and hands-on training with local, state, or federal law enforcement agencies. 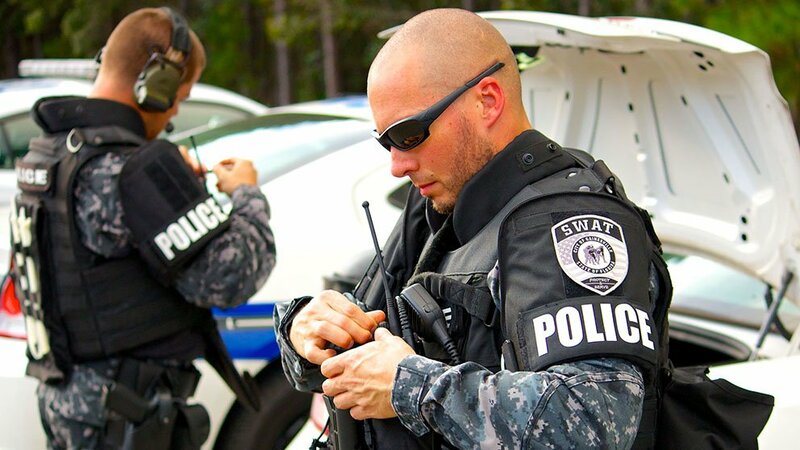 There is no single career path for physicians who serve with SWAT teams — although some start out in the military — and law enforcement agencies each have their own criteria for accepting candidates. For most physicians, being a SWAT doctor isn’t a full-time job. Many have other positions, including in academic medicine, that enable them to donate their time to the team. In some cases, emergency medicine physicians at teaching hospitals devote a portion of their allotted department hours to working in law enforcement settings. And SWAT team physicians are sometimes paid as part of a broader position, such as an EMS medical director for a particular jurisdiction. Once they’ve joined a SWAT team, physicians typically meet with the group once or twice a month to engage in exercises, including simulated medical emergencies in “tubes” (anything from a subway car to an airplane), rescues using ropes to extricate the injured from upper stories, responding to an active shooter in a public space, and more. Most SWAT physicians also have training in the safe operation of firearms, and many carry weapons with them when deployed. When a physician isn’t armed, a SWAT officer is typically assigned specifically to protect the medical team. Some law enforcement agencies also send their physicians and medics through a police academy and then deputize them with law enforcement powers. Certainly, there’s an adrenaline rush to law enforcement medicine, but the working lives of SWAT doctors aren’t always the stuff of Hollywood thrillers. Murray’s team, for example, is made up mostly of men in their thirties and forties. “There’s hypertension, hyperlipidemia, sports injuries, you name it,” he says. Given that SWAT teams are like close-knit families, members are often more likely to turn to him than to their own physicians, he notes. For most SWAT doctors, the work is a labor of love, say those involved, and they choose this potentially dangerous field in order to give back to their communities.